Director Pandiraj's Idhu Namma Aalu (INA), starring STR aka Simbu and Nayanthara in the lead roles, is 75% complete. Just some talkie portions and a couple of songs are left to be shot. 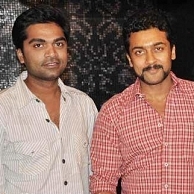 The movie has Simbu's brother Kuralarasan's music, and has Balasubramaniem's camera. And, earlier we reported about director Pandiraj's new movie, starring Bindhu Madhavi and 2 kids in the lead roles, for actor Suriya's 2D Entertainment and the director's own Pasanga Productions. Based on the the dates of the artists involved, director Pandiraj plans to shoot both these movies on parallel tracks. People looking for online information on 2D Entertainment, Idhu Namma Aalu, Nayanthara, Pandiraj, Simbu, Str, Suriya will find this news story useful.